Your mother and grandmother have likely read a few of these: House and Garden, Ladies Home Journal, McCall's, House Beautiful and Good Housekeeping. Today, magazines like Martha Stewart Living, Country Living and Real Simple likely find their place on mom's coffee table - or your own! Books on the subject were numerous and continued to spawn as the 20th Century approached: An Encyclopedia of Domestic Economy, The Concise Household Encyclopedia and Mrs. Beecher's Housekeeper and Healthkeeper were among some of the titles. Many of these early publications combined strict moral standards with household governance. Those who kept 'good, Christian homes' were those who maintained order and simplicity. Elaborate displays of wealth were just as admonished as total disregard for presentation and home care. Nearly all of the women who ran these magazines and wrote these advice manuals were the wives of upper-class men, but they were resolute in their effort to write for the 'everyday' woman. The advice had to be widely useful in order to spread the gospel of the well-cared for home to as many women in society as possible. 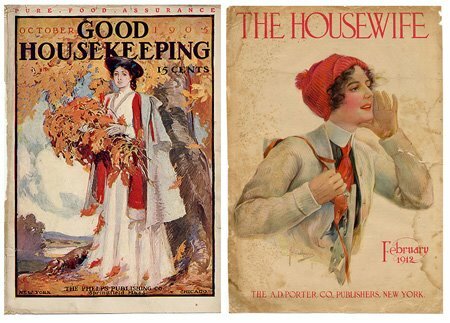 Good Housekeeping is one of the oldest magazines in the world, over 100 years old. This one, on the left, is from 1905. The Housewife was another popular publication. This one, on the right, is from 1912. Current publications have lost their moralistic edge, although lifestyle magazines today do still maintain a certain regard for improved household function, implying that a sense of virtue and discipline can be achieved when the house is in order. Cookbooks, too, found a much more solid popularity during the Victorian era. The first cookbooks can be traced to the early 1700s. It took the French, however, to come up with what we know today as 'the recipe' - including the formalized measuring system that makes food preparation so much easier. Prior to the establishment of standard measurements by the French, women had to rely on shared advice about the quantity of ingredients. There was surely a lot of trial and a lot of error in those early days! 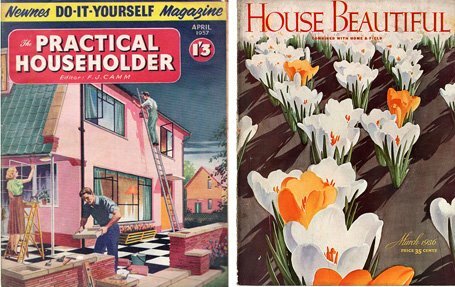 A 1957 issue of The Practical Householder and a 1936 issue of House Beautiful. The image on the cover of the magazine on the left emphasizes the importance of the family working together to improve the home through hard work and cooperation. The magazine on the right features a luxuriant and beautifully simplistic illustration of a bed of crocuses, luring the reader into its pages. The subject of domestic advice saw an enormous decline in the late 1960s and throughout the '70s and early '80s. Magazines on domestic aesthetics and cooking plunged in popularity. It was a time of social upheaval; feminists saw the housewife as a treacherous and traitorous individual who was subservient to male forces; even women who wanted to be homemakers were often forced to work outside the home because of the faltering economy; Americans had little time to worry about what was for dinner or what colour the sofa ought to be when men were being shipped off to war, conjuring record numbers of protests in Washington; race relations were in turmoil; punk and pop and disco emerged; there was revolution everywhere. As American society continues to modernize, the appeal of the lifestyle magazine has enjoyed a resurgence, spreading once again to all sectors of society, including men. With more and more single men on the scene, not to mention a more visible gay community, the timeless advice once meant only for women is finding an audience with the guys. This is both a necessity and a desire, I believe. Men are required to cook and clean much more than they were, even 20 years ago. Wives who work outside the home will no longer stand for the idea that they should do all the housework and raise the kids on their own. More men, too, seem to enjoy the pleasures of cooking, parenthood and keeping house, inside and outside. This desire to decorate and impart a sense of their own style on their own surroundings is a kind of 'coming out' for men who had previously left it all up to the women. It's a sign of growing equality. The cover of a 1935 issue of House Beautiful features a bouquet of flowers crafted from paper on a green shag rug. Seventy-six years later, Martha Stewart showcases an arrangement of roses from her cutting garden on the cover of the June, 2006, issue of her magazine. 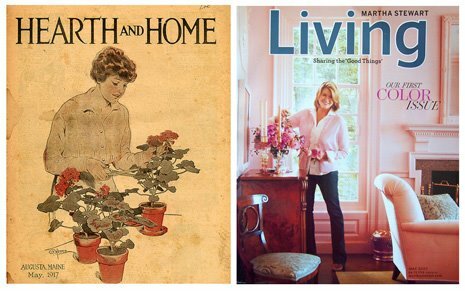 An issue of Hearth and Home from 1917 bears some resemblance to a 2007 issue of Martha Stewart Living, 90 years later. It was customary in many early domestic advice magazines to feature the 'woman of the house' on the cover enjoying her surroundings and demonstrating the effective control she had over home management. In some ways, these early domestic magazines were manuals for self-empowerment, launched more than a century before the 'self-help' movement found its roots. Children, too, had publications of their own, filled with craft ideas, games, stories and projects. One of the earliest was Child Life. The example on the left, from 1931, is an Easter edition with a beautiful illustration of rabbits carrying Mother Goose in an egg-cup carriage. Martha Stewart created a similar magazine for children, called simply Kids. 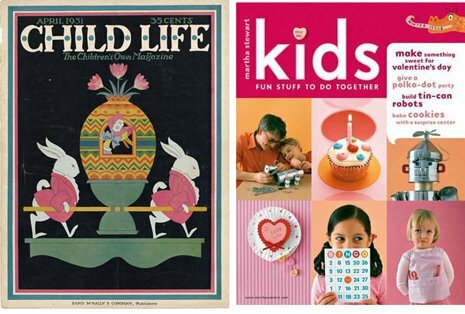 Made for both the parent and the child, the magazine featured fun recipes, craft projects and activities to do together. 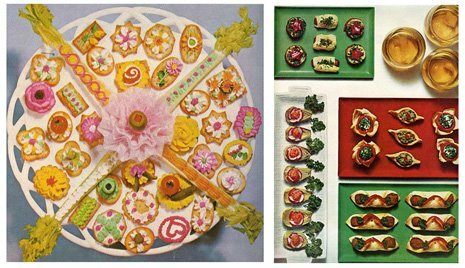 Food photography found its artful footing in the 1940s and '50s in domestic magazines, like Good Housekeeping and American Home. 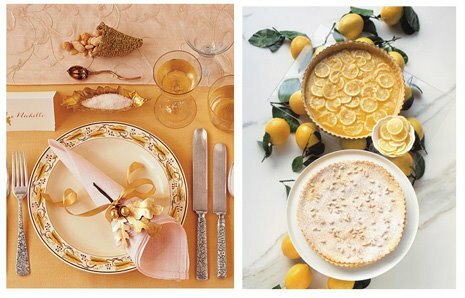 Many food and lifestyle magazines today feature the hallmarks of this early photography, most noteably the aerial shot: photographing food and place settings from above to showcase presentation. The look is modern and well designed. 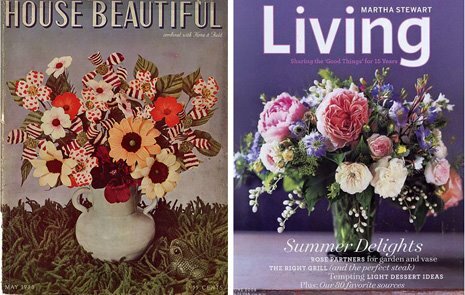 Martha's magazines resurrected this form of photography, as seen below, and has influenced countless other magazines to adopt a similar photographic stance in much of their food and organizational imagery. Imagery from Martha's magazine demonstrates the full effectiveness of photographing details from above. There has been little written about the design of lifestyle magazines (photography, layout, typography, colour, dimensions) and I think it would be a fascinating topic to study. New domestic manuals, or lifestyle magazines as we call them today, continue to appear on the newsstands, although the market now is saturated with them. Real Simple is one of the most popular ones. Borrowing heavily from the look and feel of Martha Stewart Living, the magazine emerged as a counteraction to the 'fuss and circumstance' of MSL. Its manifesto seems to be: "Get the Martha look without all that work." Its emphasis is on consumerism, purchasing power and time-saving devices to make living as effortless as possible. Personally, I find it void of soul and charm (not to mention a complete Martha Stewart Living parasite) and I think its focus is really quite lazy. 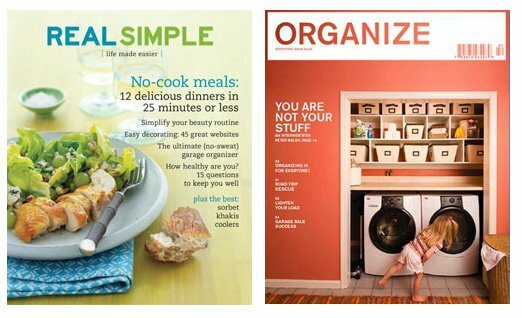 One that emerged last year is Organize magazine. Capitalizing on America's insatiable need to have everything in order - a relatively new, post 9/11 need to exert control in simple ways in an often-maddening world - the magazine's clean design and straight-forward photography imparts a streamlined way of thinking. As families and household technologies and the dynamics of family continue to evolve, so to will the domestic manual. There is little evidence to suggest that the lifestyle magazine will wane in popularity anytime soon. A fantastic collection of magazine covers! It's quite interesting to see how the role of women has evolved over the decades - as well as the importance of the "home". The 1936 House Beautiful cover is by far the best! What an exquisite illustration. Are these all from your collection?